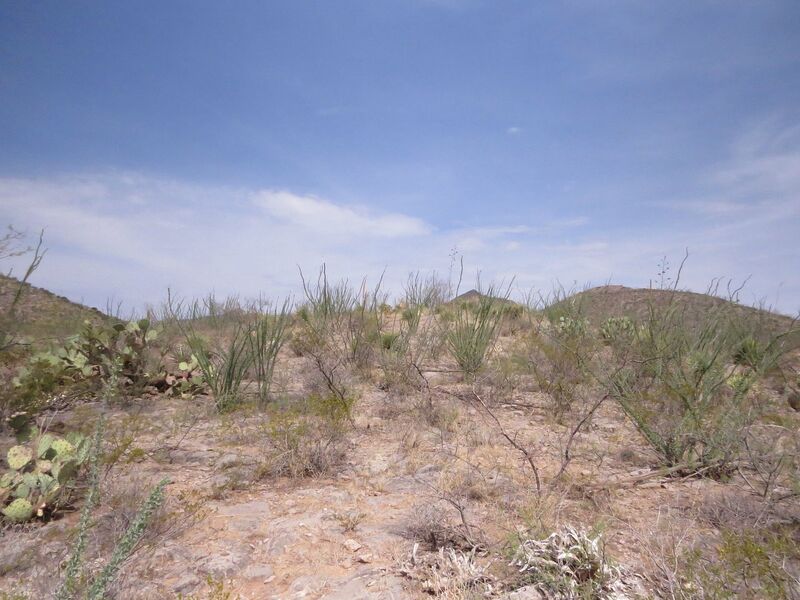 Plant life of the Chihuahuan Desert is almost like something out of a Dr. Seuss book. There's surprisingly little cacti here besides Prickly Pears and the very uncommon Barrel Cactus. Instead there are lots of these plants I can't ID. They are very tall with out stretched stems, like a series of V's, and while covered in leaves these hide some very sharp and evil-looking thorns. 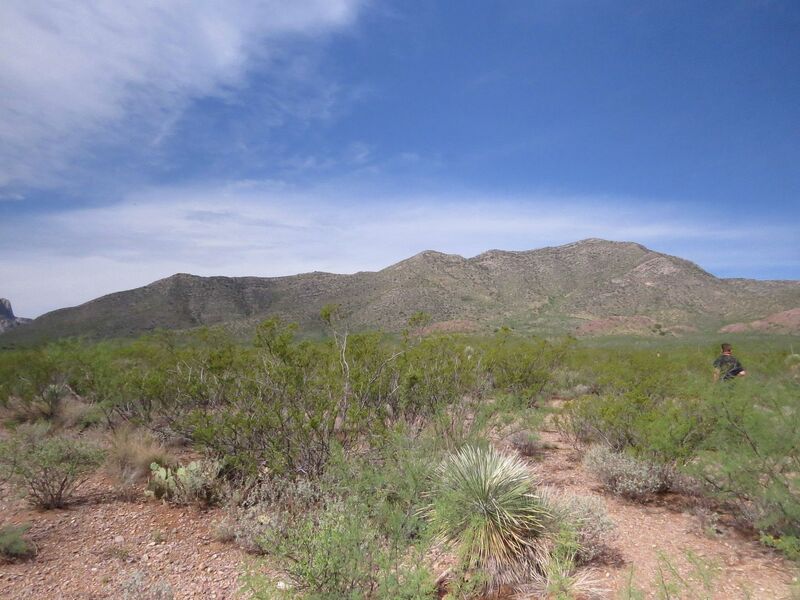 Different minerals show up on different hills and their colors stand out. 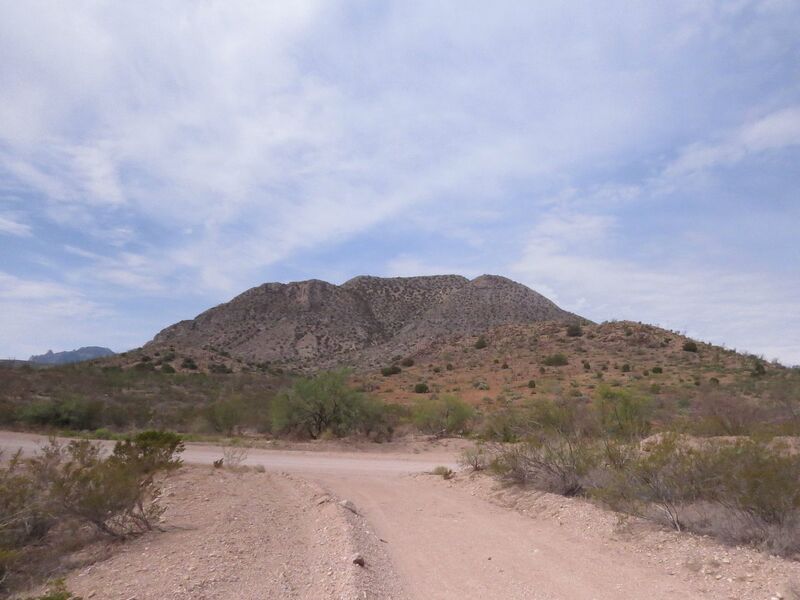 Limestone and Granite were common along the location of our desert anting expedition. On one side of the road the limestone was so thick that it formed huge sheets of stone, impenetrable to dig through besides the bits of pebbles and stone caught between their sides. Granite pebbles were more common on the other side and much easier to dig through. 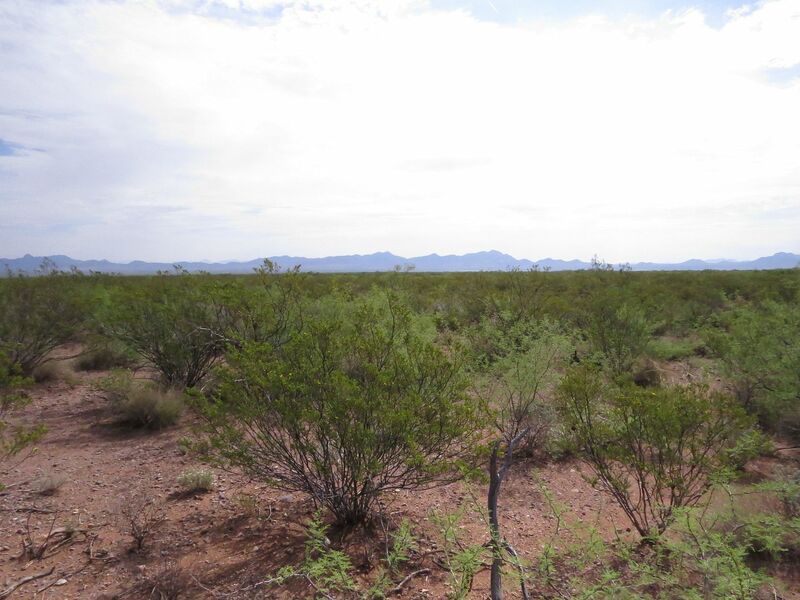 Creosote, Larrea tridentata, is the dominant flowering plant of the area. 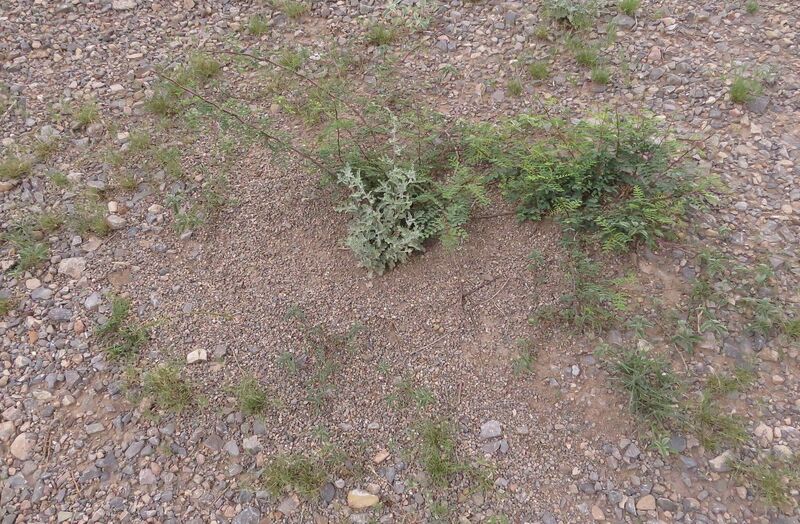 There were a good deal of Honey pot ant nests here but those will wait for another post. 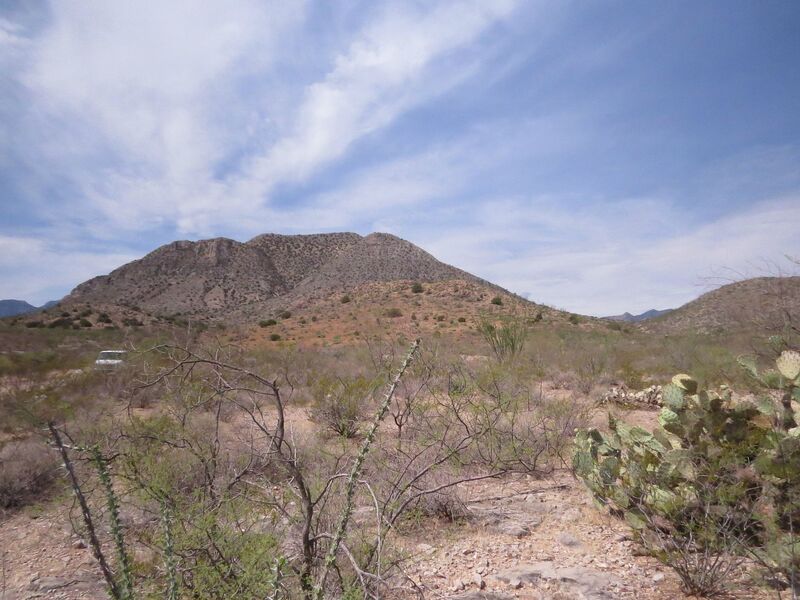 A misconception about deserts is that they are empty and lifeless waste lands of sand. But this is mostly untrue. Anywhere on earth that gets rain can support some sort of plant life, even if it's only a series of short lived annuals. Here several inches of rain are common as well as what washes down from the mountains through creeks and "washes" as they're called. There is almost no grass, at least not the thin narrow leaved kind one associates with lawns or prairies. It's mostly short shrubs spaced out with small toughed plants interspersed between. This environment makes anting almost ideal because one can very easily view the activity happening on the ground, and map out territories. 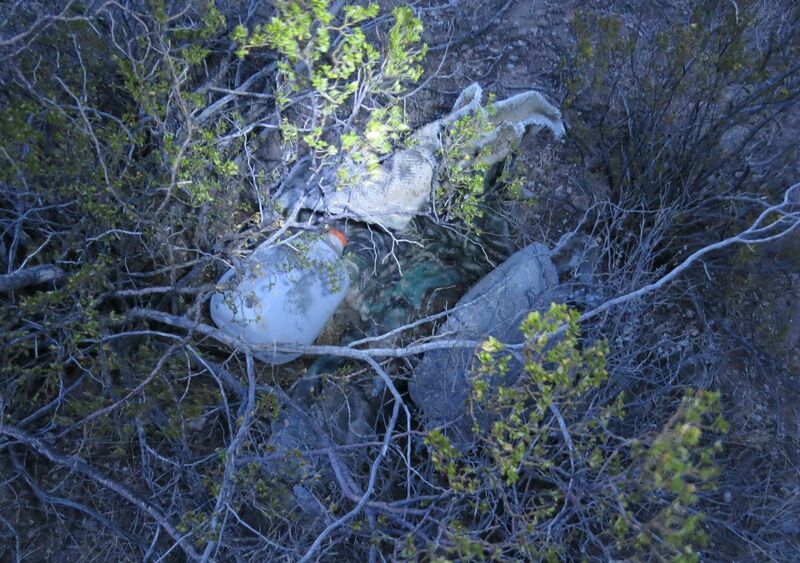 One of the things we were warned about was finding random containers, clothing, and backpacks in plane sight or hidden. These effects are one of three things: The belonging of immigrants who didn't make it across the boarder (something like 800 people die every year trying to make the crossing). 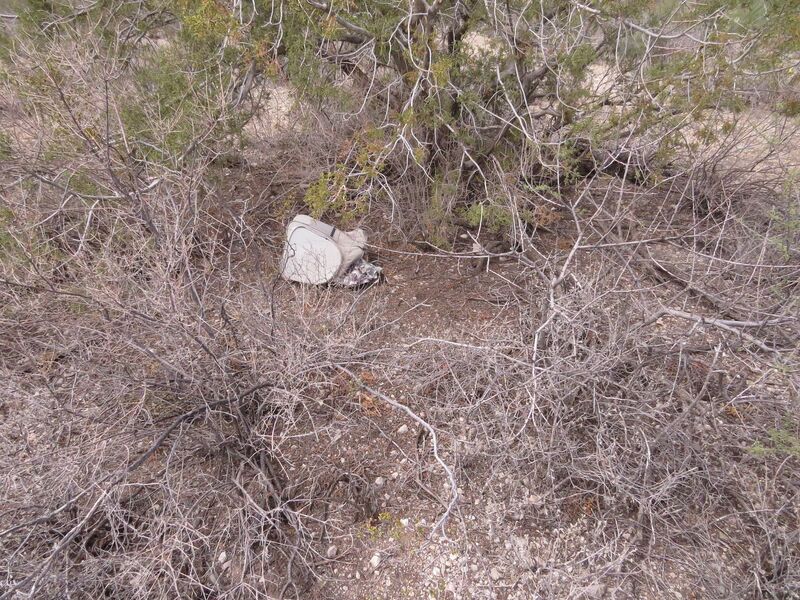 Water bottles hidden by the locals to help immigrants make the crossing, which they're not supposed to do, but it's the unfortunate answer to the problem of finding people dying of thirst on their property. And lastly, drug trafficking. They actually told us to simply ignore this, ignore people, ignore the things we find. Report it to someone later on but when finding the item, don't do anything. Don't take pictures of it (as I did above) because if it is drugs and you're viewed taking photos of their location these people might come after you. 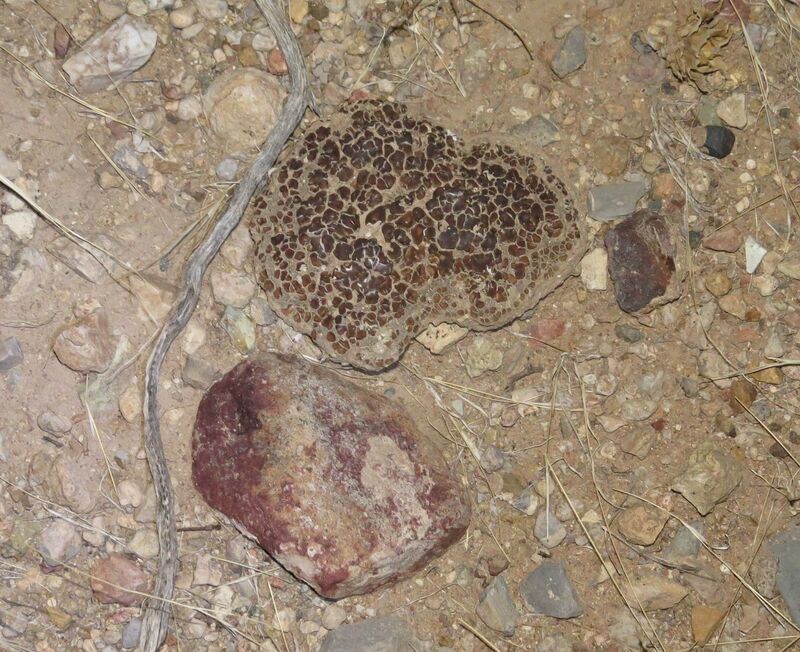 Instead we were supposed to pay attention to other things... like this desert lichen. 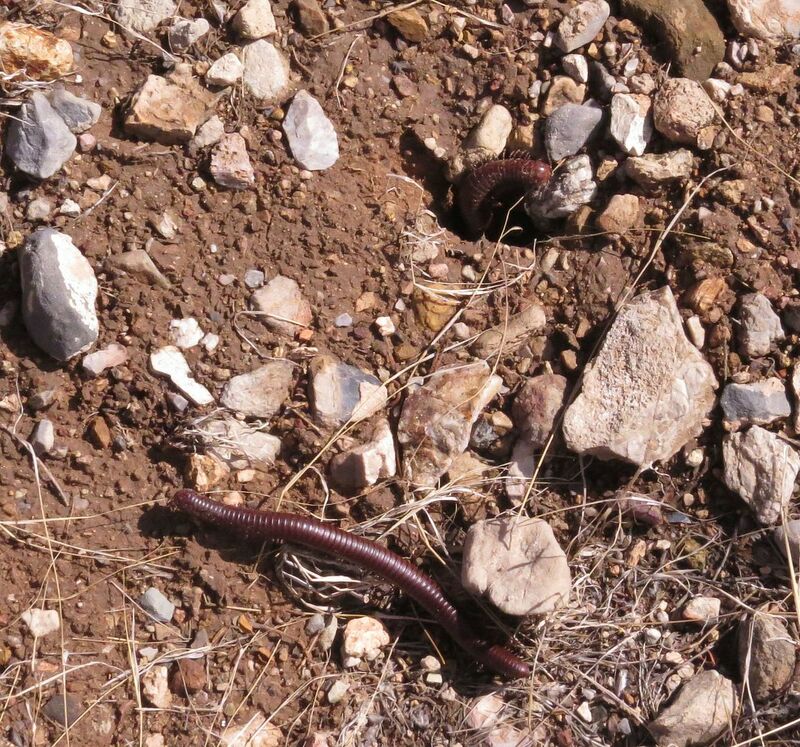 After rainfall the desert worms comes out and crawl all over. 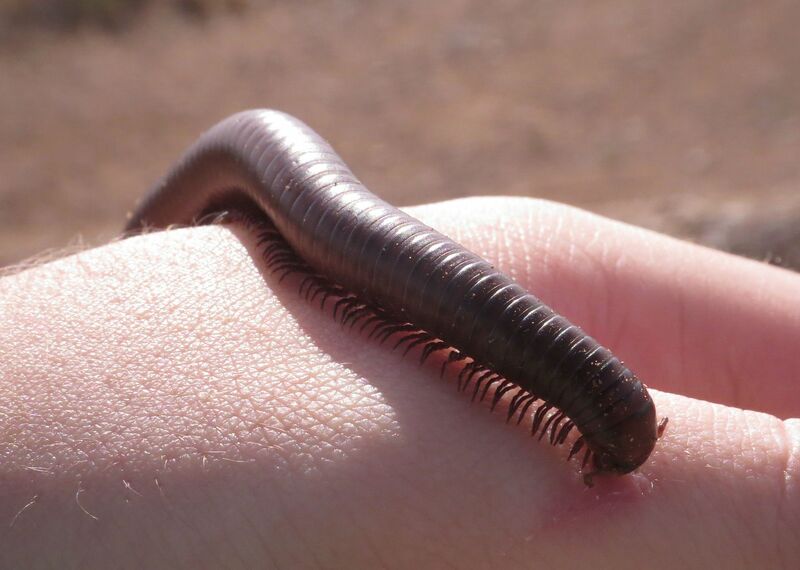 The millipedes out there are enormous. But as the instructors liked to point out, "That's a small one," despite it being longer than my fingers. Also out was this Grub. I honestly forget what it was exactly, though we ID'd it in class. 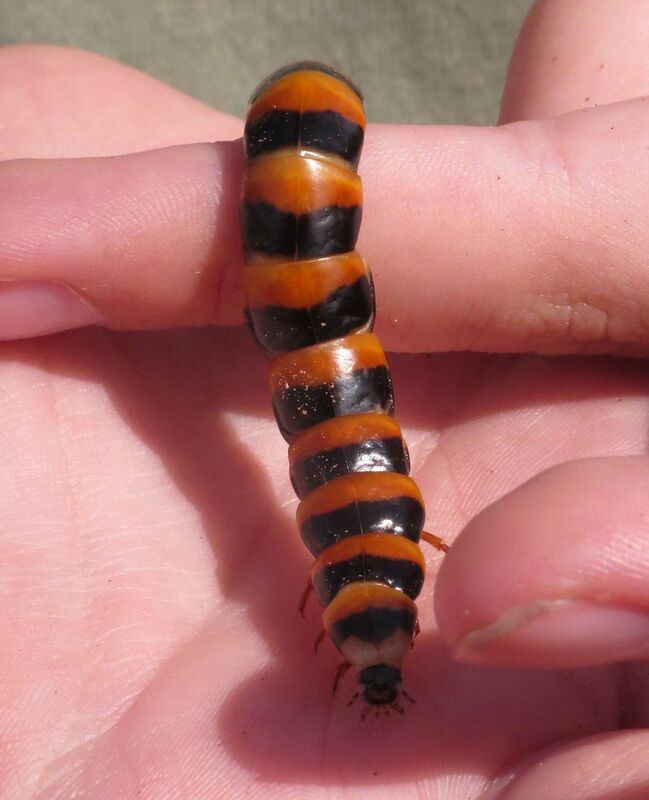 The grub form to this species of beetle is a specialized predator of giant millipedes. 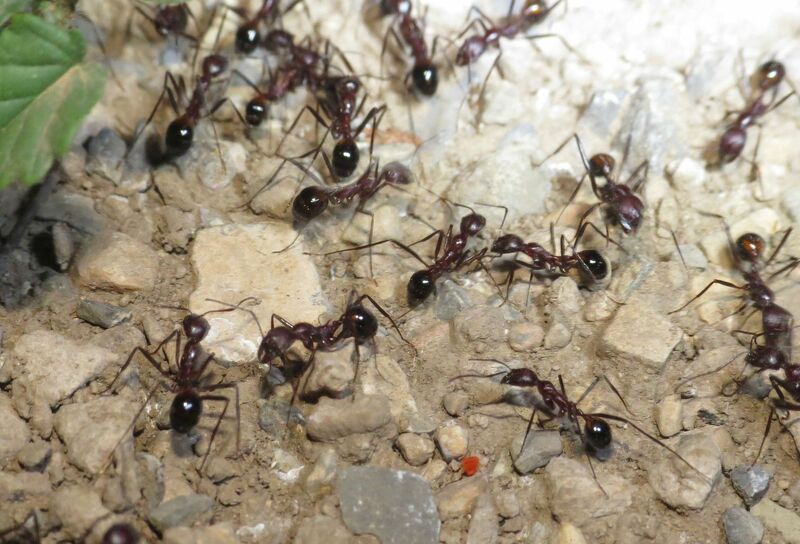 And of course also out and about were the ants. There were two main species of Aphaenogaster and both seem to live the same way. They build a series of different nests, or perhaps it's the same nest with multiple large hill entrances over the course of a few meters. Aphaenogaster cockerelli and Aphaenogaster albisetosa are two very similar species. A. cockerelli have curved spines, while A. albisetosa have more erect spines. They are otherwise very similar looking and can have multiple color patterns depending on where the population was found. While active in the day, they are rampaging at night. This is when they move their nest about. They seem to dig out new locations and possibly in advance of the move, and possibly connect the new location with the old by underground tunnels. They maintain three to five of these locations as their own, and abandon or add some as needed. 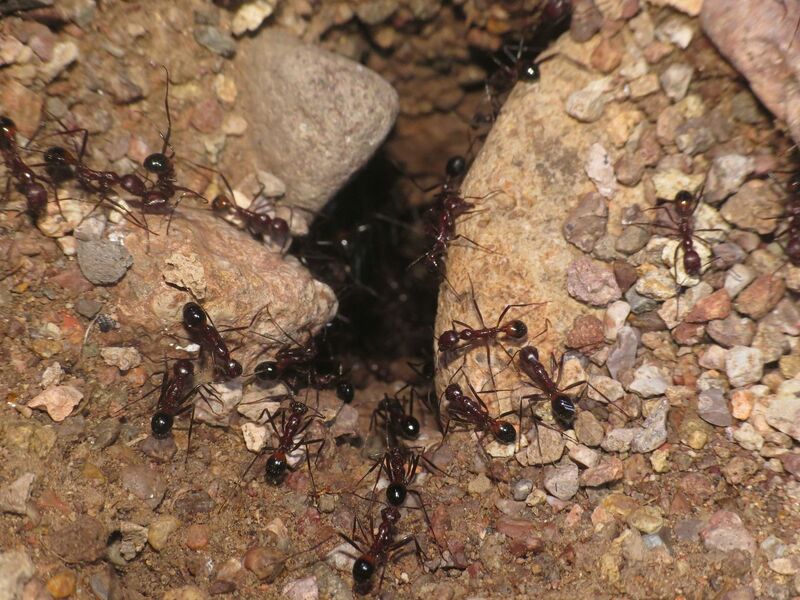 This behavior of setting up satellite colonies is a defense against Army Ants, which are specialized predators of other ant colonies, and always attack underground. Despite the huge size of the Aphaenogaster colonies here, my understanding is that they'll evacuate the nest at the first sign of invasion. They gather stones of a specific size and place them all around the entrances of their nests. 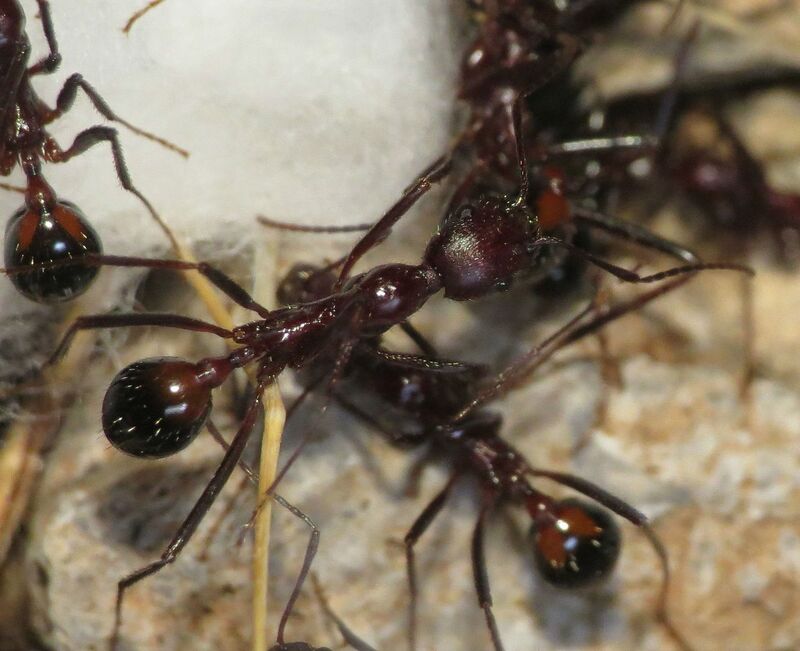 The reason for this is because of another genus of ant, Dorymyrmex, which are the annoying assholes of the ant world. Before sunrise, Dories will run to rival ant colonies and close up with dirt and debris. But they only do this if there's dirt around the entrance within a certain distance, otherwise it's not worth it for them to keep spilling dirt into the entrance at all. This kind of harassment continues for as long as they can, sometimes preventing the rival colony from doing most of their foraging for the whole day. So a lot of the desert ants will put these stones, which are just big enough for the Dories to not be able to lift, and this patch of stones usually extends 12" or more all around the entrance. Meaning if the Dories want to try and throw dirt down the enemy hill, they have to wonder 12" to locate the hole and then venture 12" back to find dirt, and then back again to drop it in the entrance. 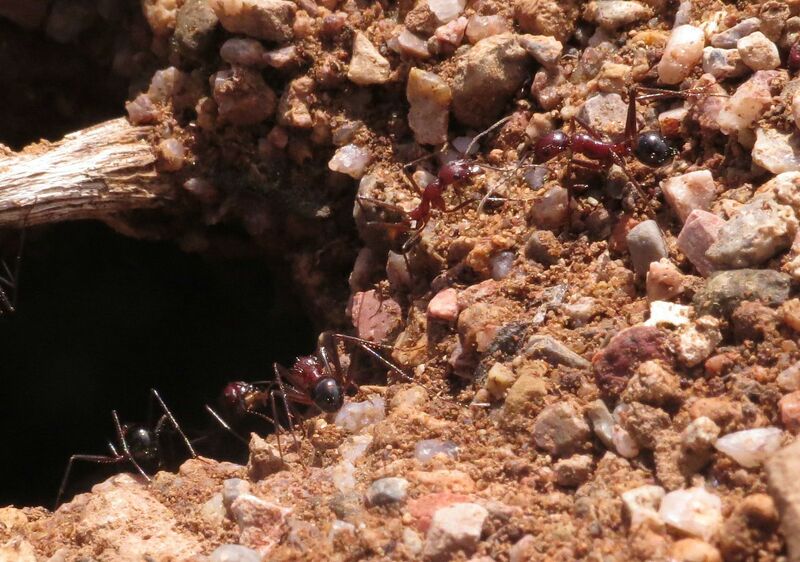 Now the Aphaenogaster, Pogonomyrmex (Harvester), or Myrmecocystus (Honeypot) workers simply needs to remove the dirt, so it becomes a question of who has more ants. 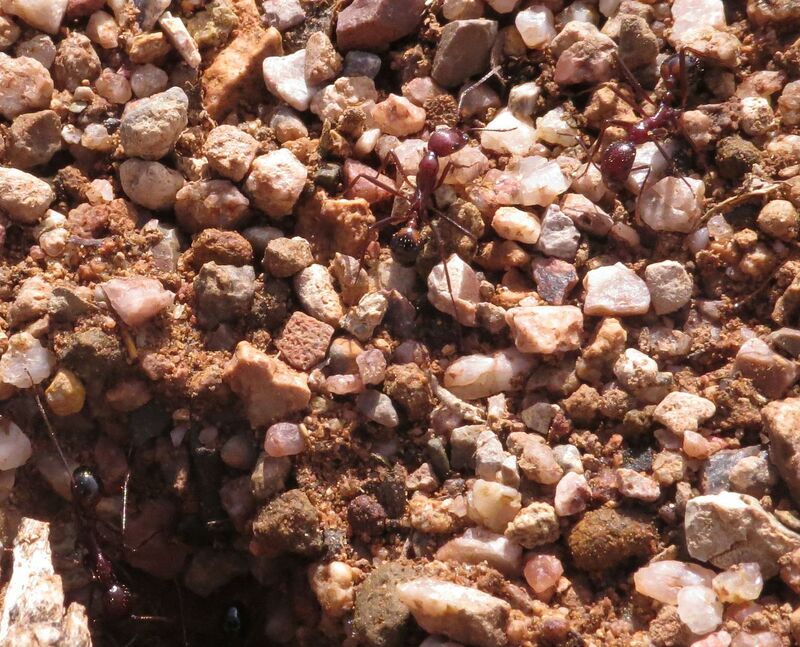 Colonies that don't have these stones, or the stones were washed away or buried in the dirt from rain, have a harder time fending off the Dorymyrmex harassment because the Dories have less to walk, and can essentially push the dirt into the hole. 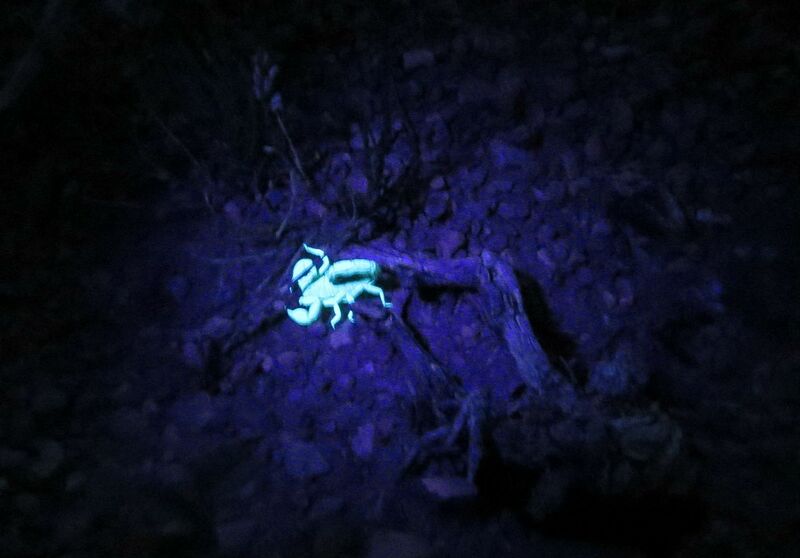 While observing a nest I noticed a scorpion right at the entrance. It was a very tiny one, as I learned pretty much all scorpions are out there, at only two ant lengths. The ants themselves didn't bother with it, in fact they walked over it as if it wasn't there. Shining a black light on them makes them glow in the dark and significantly easier to see against the pebbled soil. 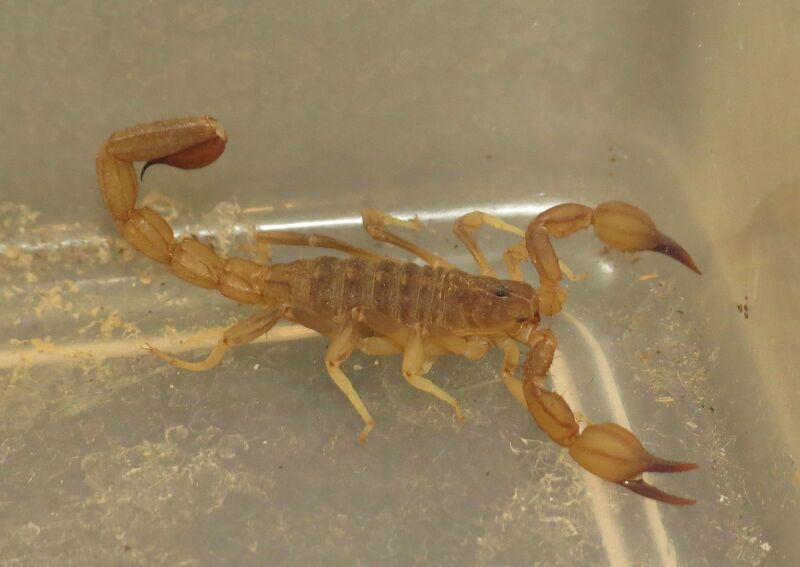 This scorpion species is of some interest scientifically, because no one knows what the relationship is here. Are they too lazy to dig their own burrows? Is it just the females using the ant nests? Does it eat the ant brood? Does it eat the ants? Does it reproduce inside the ant nest? All of these are questions that no one knows the answer to. So upon finding the one we were immediately told to catch it... and I replied "Aren't the little ones deadly?" The response I got wasn't all that encouraging but I'm under the impression that it's like a bee sting. You have to be allergic to the venom for it to be serious. There is the Bark Scorpion is another story but they weren't reported in the area. 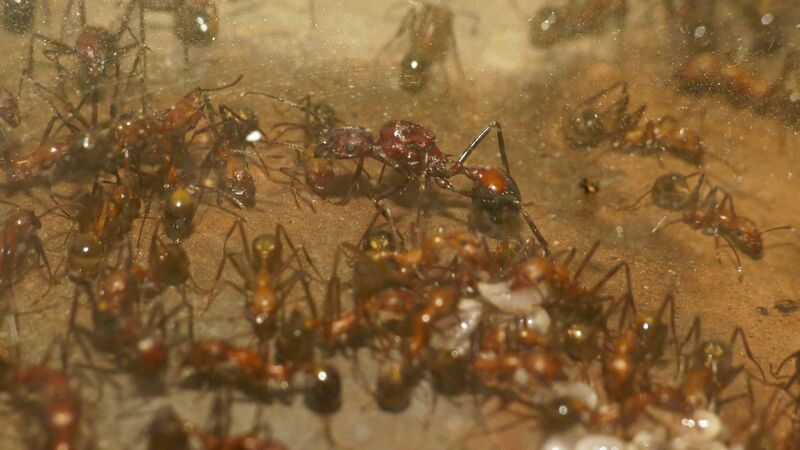 Deep within the Aphaenogaster nest there is a single egg laying queen. She has a more developed gaster (abdomen) and retains the thick thorax which housed her wing muscles when she flew off for her nuptial flight to start the colony. Aphaenogaster become one of the more dominant foragers at night and occasional skirmishes happen among the more predatory insects. 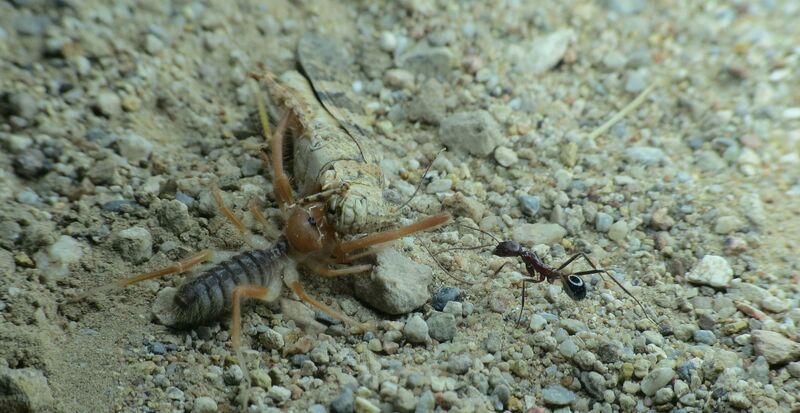 Here a Pseudo-scorpion has found a dead grasshopper which an Aphaenogaster test the waters to see if recruiting more workers could steal the prize away. 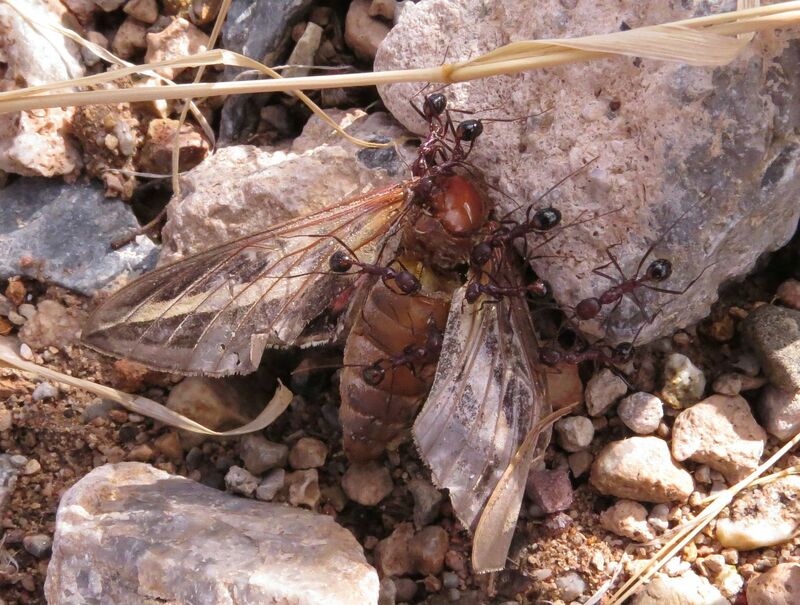 The Pseudo-scorpion won in this case as it dragged the grasshopper out of the colony's range.